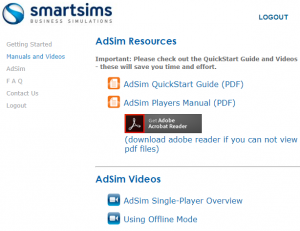 AdSim Advertising is our Principles of Advertising simulation. In AdSim, you will have the opportunity to formulate and implement your own Advertising and Promotion Campaign of your own virtual company. The primary goal of your company is to build your company to the dominant player in the Digital Camera market and your maximizing Cumulative Net Marketing Contribution (CNMC). Positive Net Marketing Contribution occurs when Sales Revenue is greater than Marketing Expenditure. AdSim has two phases of the simulation. It is important that you know the difference between these phases, and that you are entering your decisions in the correct World.